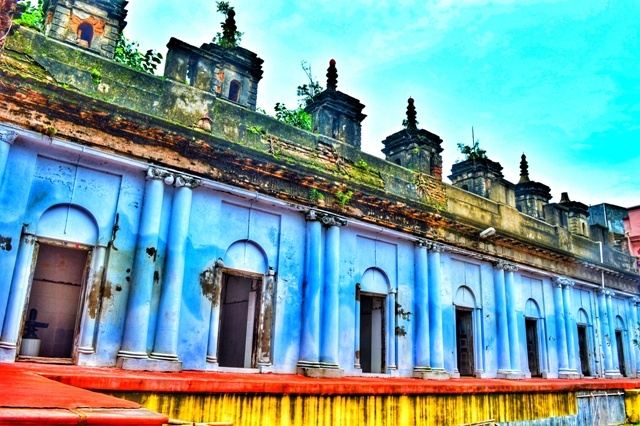 Andul Rajbari and Annapurna Temple : A heritage drive in Howrah - Ghumakkar - Inspiring travel experiences. 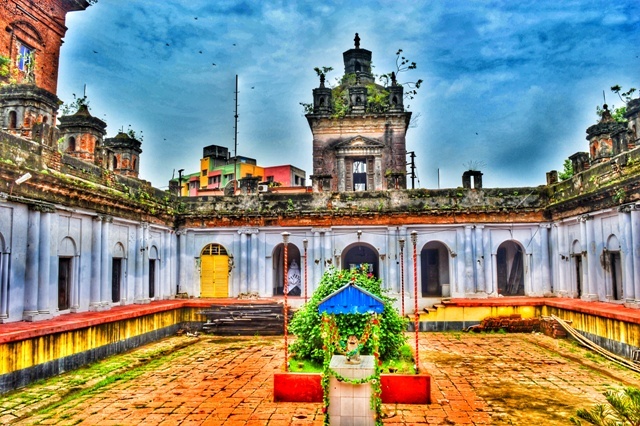 The Andul Rajbari which is locally popular as Ananda Dham is a popular tourist destination in Howrah district of West Bengal. 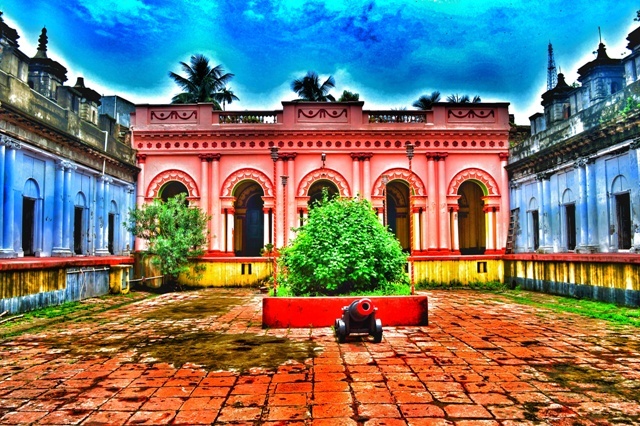 We planned a short trip to visit the Andul Rajbari recently. One fine monsoon morning we hired a car and reached Andul. 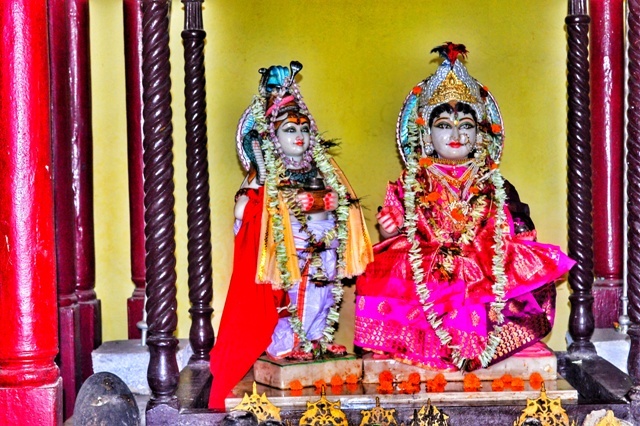 Sri Chaitanya during his holy journey set his steps in Dakshin Nabadwip. And the place came to be known as Andul which etymologically comes from “ Ananda Dhuli” meaning the holy dust from the foot of Lord Chaitanya. 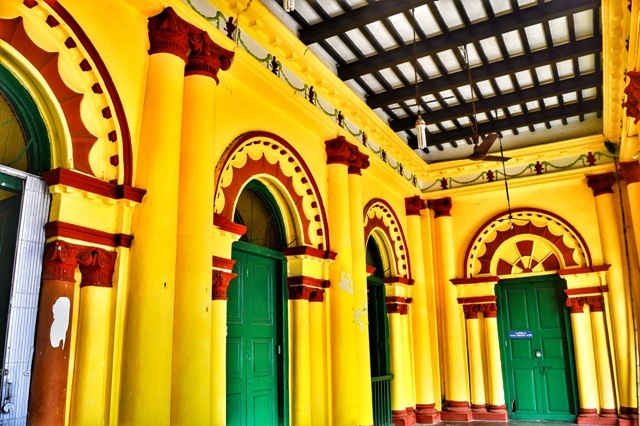 After parking our car in the main road, it took us around 10-15 minutes to find the Andul Rajbari winding past the narrow roads crowded by innumerable shops. The royal structure adorned by massive pillars in the front and a large open field greeted us. The open field is the place where the fairs take place on relevant occasions. Another notable place to visit is the Annapurna Temple along with its 14 Shiva temples. One is almost sure to miss the entrance gate of the temple complex but thanks to the worn out Nahabatkhana on top of the entrance gate which acts as a landmark. 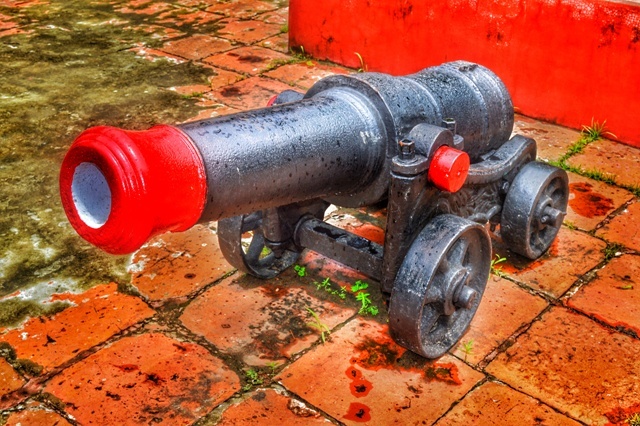 On entering the temple complex we found a beautiful cannon which is said to be gifted by Lord Clive. People from all age brackets gather in the courtyard and seat on the floor to relax. The priest was seen busy performing the daily worship rituals moving from one Shiva temple to the other. 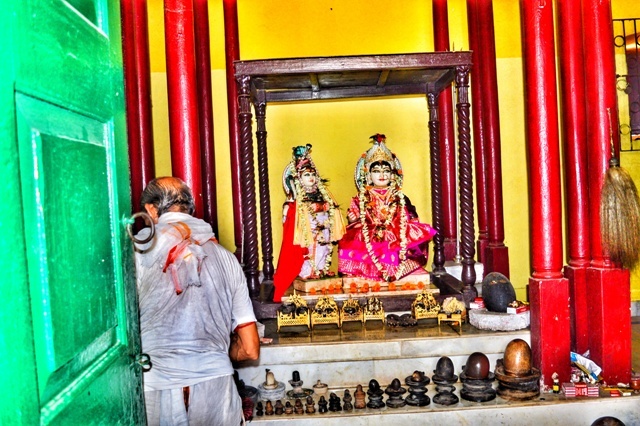 Rajnarayan Roy established the temple in 1845. His mother during her younger days often visited the Annapurna temple in Varanasi as she was a devotee of Annapurna. But with age crippling in, she was unable to continue the annual journey any longer. Her husband Kashinath Roy started building the Annapurna temple along with the 14 Shiva temples in Andul itself for his beloved wife. But Kashinath died in between and his son Rajnarayan fulfilled his parent’s wish by constructing the same. Currently, the temple is run and maintained by Andul Raj Debuttor Estate. The walls and ceilings of the temple were beautifully decorated and coloured. Astadhaatu is an alloy of metals which is traditionally used for making idols of gods in Bengal. 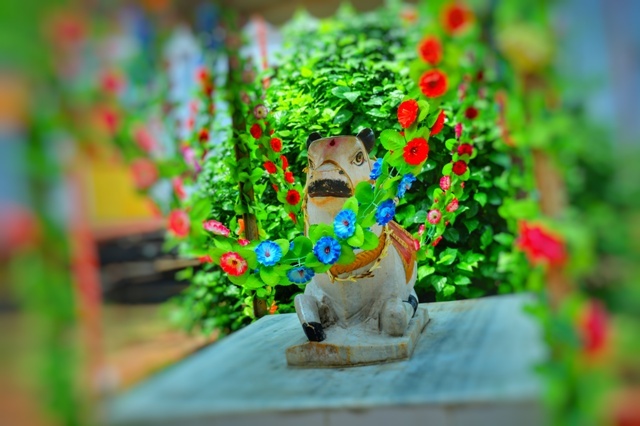 Initially, the idols of Shiva and Annapurna in the temple were made of Astadhaatu but were later replaced with concrete idols after a robbery took place. There is a brass throne was Annapurna is seated. A Shiva statue is found standing beside Annapurna begging for Alms. The statue is called “ Bhikari Shiva”. There are several salgram shilas arranged in ascending order of size in front of the Annapurna Idol. There are two more rooms on either side of the main sanctum sanctorum. One houses Shalgram Shila of Vishnu and a Gopal. The other has seven Shiva Lingas which are collectively called Baneshwar Shiva. The cannon lies in the centre of the courtyard. Earlier it was fired on two occasions during the Durga Puja. One before 15 days of Bodhon to mark the festive season and the other to alert all the villagers to attend the Sandhi Puja sacrifice ritual before Navami. Now, this firing ritual is stopped due to a shortage of ammunition and also due to an accident that took place in Burdwan due to a similar cannon firing ritual. The main festival of the temple is Annapurna Puja. Also, the temple was founded on the auspicious day of Chaitra Sankranti and huge bhog takes place on the same day. 12 brahmins are treated with mahabhog. Apart from that Dol Utsav, Durga Puja and other top festivities take place with huge pomp. Fairs are held in the field adjacent to the Palace grounds. Tirtha is a MBA from Indian Institute of Management Calcutta and currently works as a business analyst based out of Kolkata. Tirtha likes to travel and read travel stories. His interest mainly lies in history and heritage. Its interesting to see the amalgamation of architectural styles – both western and Indian classic. However the profusion of colours make it appear out of the world. 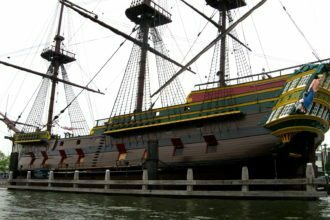 Good post on Bengal’s past. 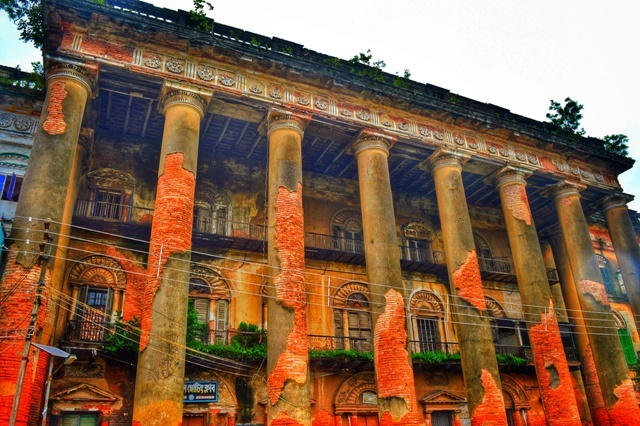 Great post on Andul rajbari with much interesting info. Have crossed Andul station on many occasions, always loaded with full ignorance about rajbari or any other worthwhile knowledge about that place, till reading this post. Pics are quite a work of art. Keep going.